See Plan a Lesson for advice on planning lessons, especially if you are not familiar with this activity. The first step in setting up a lesson is to create the lesson (or container) that will hold the content. 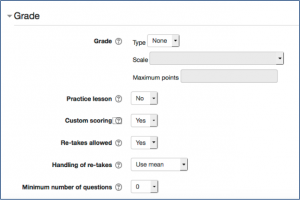 In this process you give the lesson a name and select various settings to control how it should appear to the student as well as how (or if) it will be graded. 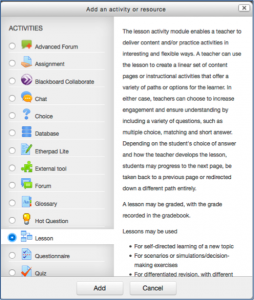 Click Add an activity or resource, scroll down through ACTIVITIES, select Lesson and Add. Give the lesson a meaningful Name. 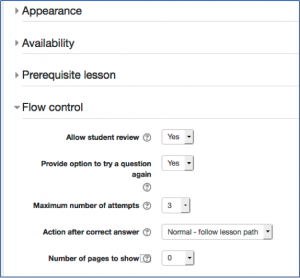 In Appearance, you have a range of options on how the lesson will behave. The File pop-up allows you to launch a file in a different window to the lesson as a reference point. For example, this might be a map for a geography lesson or a diagram for an anatomy lesson, etc. A range of file formats are possible, including video and audio as well as images and text. In terms of the other options, in the example below we have selected Yes for Display ongoing score and Display menu and left the rest as default. 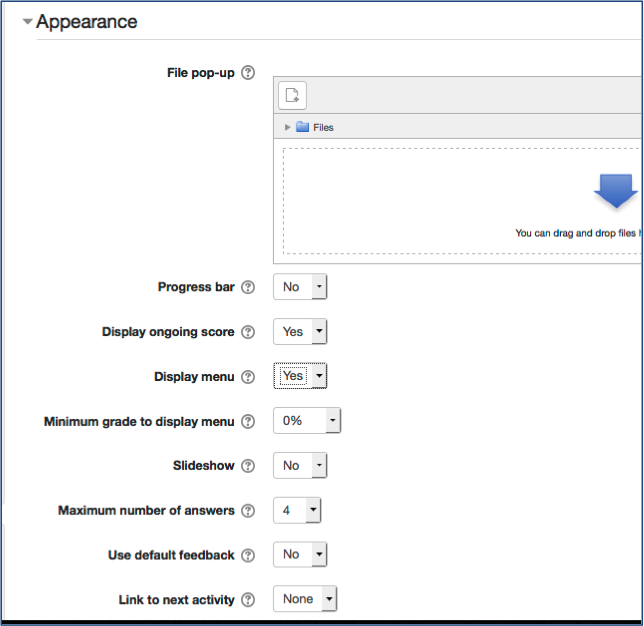 This means the students will see a score as they progress and there will be a navigation menu on the left to provide them with the ability to select individual pages rather than being guided through in a set sequence. For more information on each of the settings click that appears beside each setting, or click at the bottom of each page for context-sensitive help. 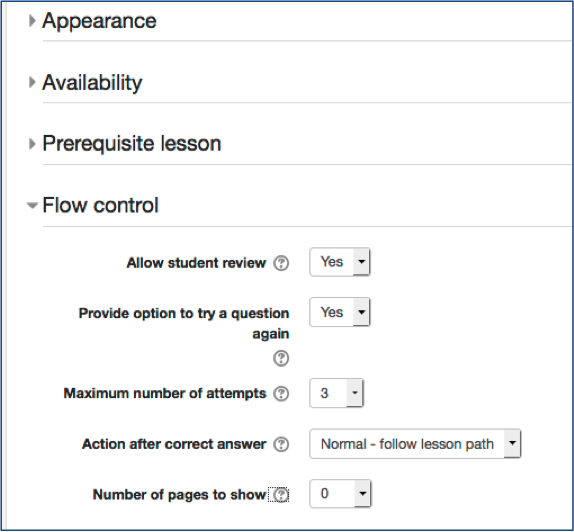 Use Availability to set a time period for the lesson if required. Use Prerequisite lesson if students need to complete a prior lesson. Flow control is quite important even for simple lessons such as the one exemplified in this guide. We have changed Allow student review to Yes to allow students to review the lesson (see also Re-takes allowed under Grade). We have also selected Yes on Provide option to try a question again. However, we have limited the number of attempts on a question to 4. Other settings are left as default. For more information on each of the settings click that appears beside each setting, or click at the bottom of each page for context-sensitive help. In Grade, choose how to handle grading and attempts. 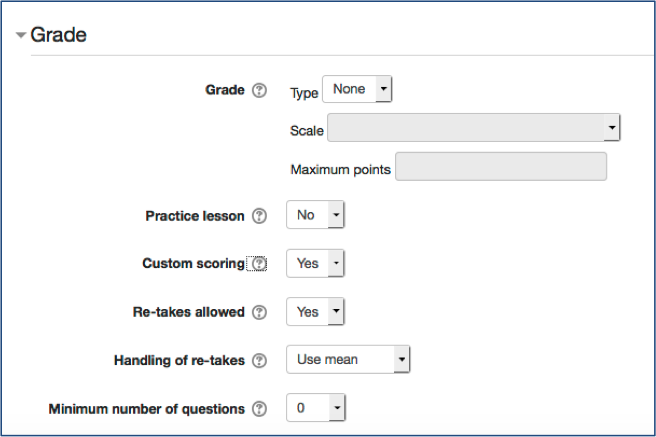 In the example below, we have chosen Custom scoring as opposed to using Grade for automatic scoring. This means we can allocate different scores per question. We are also selecting Yes to allow the students to re-take the lesson and leaving Handling of re-takes as the default Use mean. For more information on each of the settings click that appears beside each setting, or click at the bottom of each page for context sensitive help. N.B. 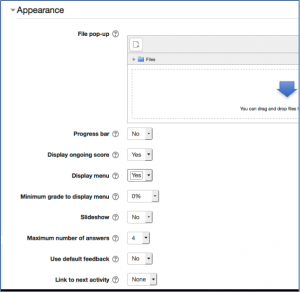 As with other Moodle activities, it is not always possible to grasp the significance of some of the settings until you have seen them in action, so set what you can on your first attempt and then revisit these settings when you have had a chance to experiment with your lesson content. 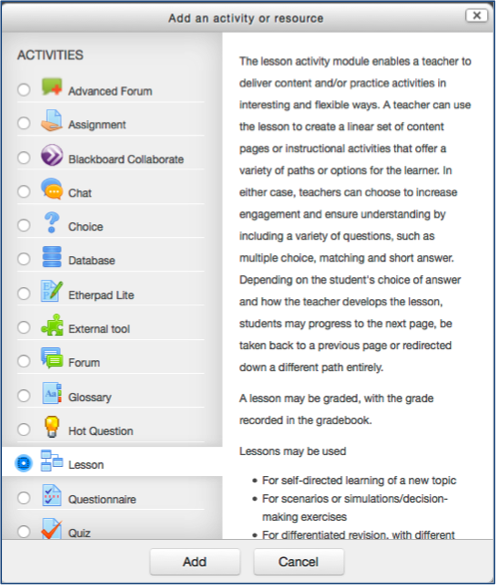 Having set up a lesson, you are ready to populate it with content and question pages. See Add pages to a Lesson.